Located on the popular Croftville Road near Grand Marais, MN. Croftville Road, which is about 50 feet from the lake, intersects the resort. Cabin #1 is built between the road and the lake shore and the other 3 are above the road, still only an average of 100 feet from the shore. Clear and simple. Easy to work with. Easy to talk to and arrange our plans. Opels 3 is perfect, with everything we need for the week we spend at the Art Colony. The view of the lake is amazing, and the road is quiet with very little traffic, and great for a morning walk along the lake shore. It was the perfect little get away. The location was great. Amazing views. It's obviously small, but it's all I need or want. Very tidy, very convenient. It was a very cute and cozy cabin. If i was to suggest anything it would be that the water pressure in the shower is not great. The cabin was very clean and organized. The beds were firm and quality bedding.The kitchen had all the pans and silverware to cook and grill our meals.The HD tv was great but only watched it once for half hour. We used this cabin as a base where we ate and slept before going out fishing again. Overall,it was great for two people and would rent it again and recommend it to others. Very clean, well equipped and comfortable beds. I loved seeing Lake Superior out of the windows. The cabin is clean and well equipped for cooking. The beds are very comfortable. We slept very well during our stay. Plenty of towels. The wifi was a great plus. The living space is very small. We rearranged the furniture a bit to make it more workable for us.The tv is very tiny, about three times the size of my iPad mini, but we didn't spend that much time watching tv anyway. Loved the location. Fantastic view of the lake. The street in front wasn't busy. A very quiet location. The cabin is a perfect size for a couple or small family. It may be a bit too tight for 4 adults. Overall, it's a nice property and we would stay here again. We loved the cozy cabin and the amazing view of the lake! Love the privacy. Nice location with relaxing beach access. Very clean with everything needed. 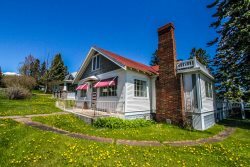 I have stayed at Opels when I come to Grand Marais to the art colony, for at least 15 years. I continue to come back, because the location is fantastic, the cabin perfect for what I need, and it has always been easy to book with Cascade. Every morning I walk Croftville road and enjoy the lush beauty of the lake, the woods and flowers along the way. At breakfast it is wonderful to look out the window and watch the lake. The whole experience is a beautiful inspiration for my art work. Thank you. PS. the only suggestion I would make is to provide larger ice cube trays.